First-time Feature Writers Ryan Morrison and Joe Penna (who also directs) deliver a standout directorial debut which features a tour-de-force performance from the incomparable Mads Mikkelsen. Arctic is a riveting Thriller that focuses on the question, if you’re stranded somewhere in the Arctic, do you travel outside or inside your ‘safety zone’, praying help will eventually arrive? 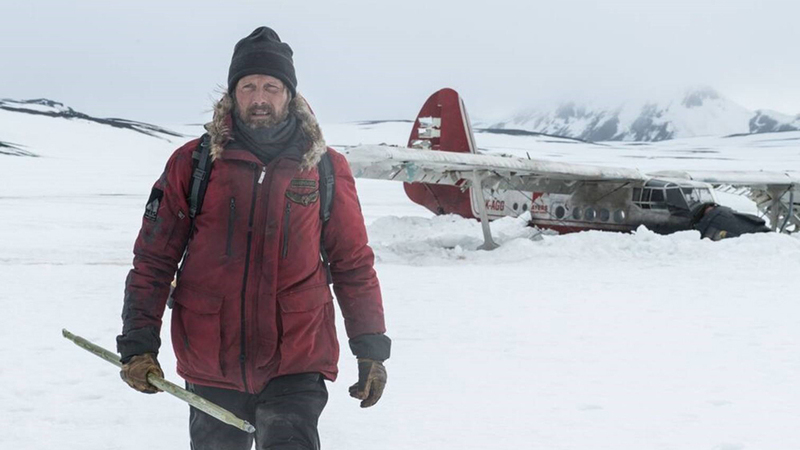 Overgård (Mads Mikkelsen) is stranded somewhere in the Arctic. We have no idea how he got there or really how long he’s been there, all we know is he’s stuck. He has a routine of fishing and attempting to get rescued that plays day in and day out. Hope is seemingly lost until a young woman (María Thelma Smáradóttir ) flies over Overgård’s location and he thinks he is saved. Another devastating blow occurs when her helicopter crashes and now the woman and Overgård are both stuck in the Arctic with little to no resources. The performance that Mads Mikkelsen gives is nothing short of incredible. He has the audience completely captivated with little dialogue and just his journey for survival. His performance is just so engulfing and that it makes us reflect within ourselves. Arctic is so beautifully-filmed as well, Tómas Örn Tómasson‘s Cinematography is absolutely stunning. Arctic is such a beautiful reminder of our own humanity and fragile humanness. There have been other attempts at creating a hurricane in a water bottle, but there haven’t been many movies that can achieve it such as well as Artic does. The performance from Mads and the story by Ryan Morrison and Joe Penna is truly remarkable. Elevation Pictures releases ARCTIC in theatres on Friday, February 8, 2019.